Raven will have her puppies in less than one week and the questions remains: What supplies do you need before your dog has a litter of puppies? Do you have a whelping checklist? My mother was a huge fan of checklists when we were kids. As a know-it-all youngster I always thought I could keep everything well organized in my head, but now that I’m older, wiser, and…ehhmm…more forgetful…I find a ton of value in the “checklist”. Today, we’re going to put together our whelping checklist so we can be sure we don’t forget any of the important supplies needed when whelping a litter of puppies. *We are not veterinarians. All of the information in this article is based on our experiences. If your dog is having puppies then please consult a veterinarian for professional advice. 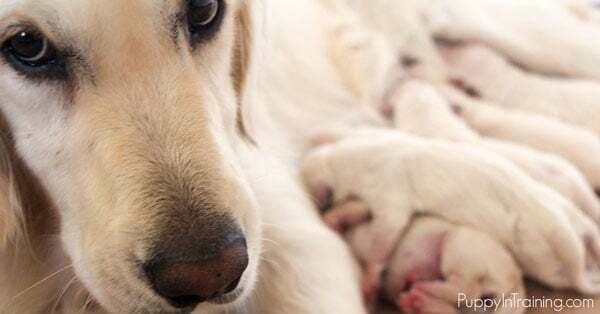 What Supplies Do You Need Before Your Dog Has A Litter Of Puppies? This time last year I was running around like a chicken with his head cut off trying to figure out what supplies I needed before Raven had her puppies. Quick Tip: This time last year we weren’t sure what we needed for whelping puppies. We researched the internet and found this basic whelping kit on Amazon that worked out really well with Raven’s first litter of puppies. However, read on because you need more before whelping your first litter of pups. I like to think I learned a thing or two since Raven’s first litter. I didn’t have a whelping checklist for litter number one. Instead I researched the internet, watched YouTube videos, chatted with breeders, and hoped I had all the information I’d need to help Raven deliver her first pups. 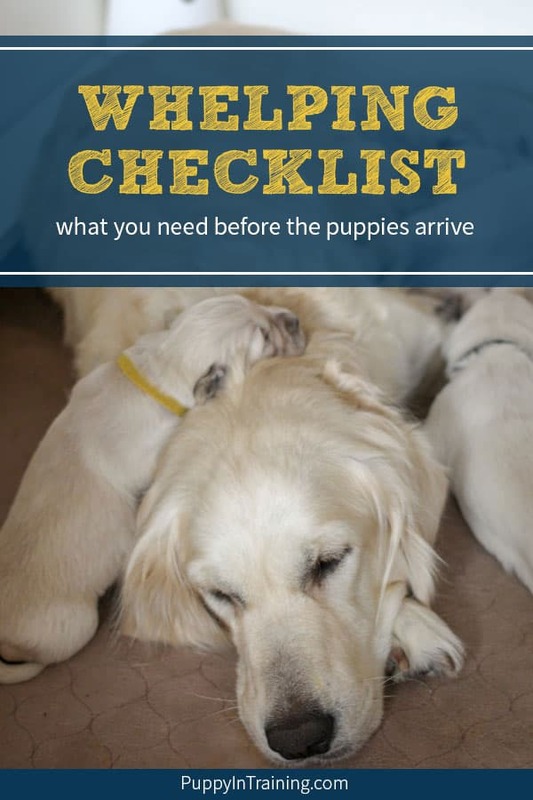 This time around I’m putting together a whelping checklist to make sure I don’t forget anything from last years successful whelping and include anything new I learned for this years litter of Golden puppies. Okay guys and gals. If you like lists then you’ll love todays whelping checklist! Our must have whelping kit items. Whelping Box – We went online to find a whelping box, but we didn’t really like the price or quality of products we came across. We (meaning Ali’s Dad) ended up building our own whelping box. Update: Our friends really like and recommended the Fab System Whelping Box. This is a product I’m considering when our DIY whelping box starts to wear down. Whelping Mat – You could just use blankets or towels, but we really like the EZwhelp Washable Whelping & Puppy Pad we got from Amazon. We liked it so much we bought a second one recently to make the cleaning process easier. Digital Thermometer – Start taking mama’s temperature 10-14 days before her expected due date. When temperature drops to 98-99 degrees get ready for puppies (usually within 24 hrs from what we’ve read) – we have this simple Digger Dog digital thermometer . Heat Lamp – Newborn puppies cannot regulate their body temperature. Last year Raven stayed with her pups and they cuddled up to her for warmth, but we also got a heat lamp to help keep our pups warm. We like the heat lamps with the clamp and attach our lamps to the edge of our whelping box. As I mentioned newborns cannot regulate their heat so you also want to make sure they can get away if they’re too hot. Indoor/Outdoor Thermometer – To monitor the temperature of the whelping box. Optional: We have a portable air conditioning/heating unit in the puppy room to allow us to better control the temperature of the room. As mentioned earlier, puppies cannot control their body temperature and we want to make sure our puppy room is not too hot nor too cold. Our vet and breeding friends advised that we (the humans) help in a few areas when whelping a litter of puppies. Head Lamp – One of the things we did not use as we had ample light since we whelped our first puppy in the late morning (around 10am) and finished in the early afternoon (around 2pm). However, a headlamp will allow you both your hands to be free while shining a nice light in all the little nooks and crannies. Aspiration Bulb – Use to suction the pup’s mouth, nose, and throat. We used to help clear out the airways to help our pup’s start breathing. Hemostat – Use to clamp the umbilical cord. We kept ours clamped for several minutes after cutting the cord to allow the blood to clot/stop bleeding. Medical Scissors – Use to cut the umbilical cord. Unwaxed Dental Floss – Use to tie off the umbilical cord. Tail Wrap – for dogs tails to protect from draining fluids. We did not use with Raven’s first litter, but it’s included in the basic whelping kit which I’d recommend you purchase if this is your first time whelping a litter of puppies. Vaseline – for taking a rectal temperature and in case one of the puppies gets stuck. What supplies will you need before whelping a litter of puppies? Overall our whelping area got pretty messy, but having these items will help to keep your pup, mama, and the whelping box a little bit tidier. Antibacterial Hand Wipes – Clean, clean clean. We’re always trying to keep ourselves and our area clean. Alcohol Prep Pads – On the theme of keeping clean, use these to clean off the hemostat and scissors after each use. Iodine Prep Pads – Use on the cut umbilical cords to keep the area as clean as possible. Receiving Cloths – Use to grip and dry each puppy. Pee Pads – We used the large pee pads to put under mom to catch afterbirth to try and keep our whelping area as clean as possible during the whelping. Paper Towels – To keep your whelping box area as clean as possible. Hand Sanitizer – Try to keep yourself as sanitary as possible. We used hand sanitizer not only during the whelping, but the entire 8 weeks we had the litter at our house. Exam Gloves – We used a different pair of gloves with each puppy again to try and keep things as clean as possible. There was a little variation in color in Raven’s litter, but it was still very difficult to tell the puppies apart. Puppy Collars – Not your regular nylon buckle puppy collars. You’ll need something much smaller for your newborn pups. We really like these Velcro Puppy ID bands from Amazon. 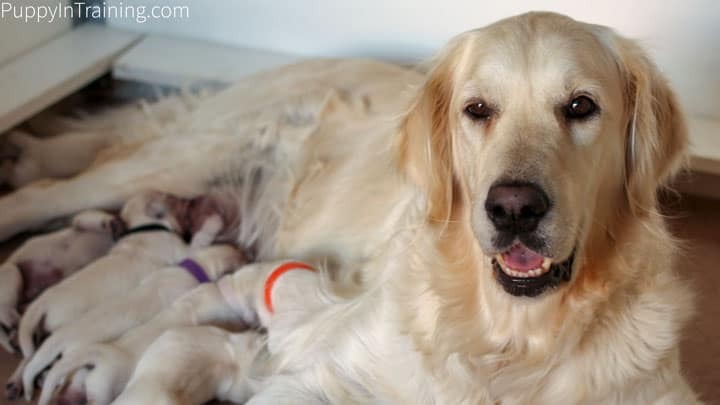 You’ll want to have some paperwork to document the mama’s temperature to help predict the arrival of the puppies as well as document each puppy as he/she is born. Temperature Plotting Sheet – Tracking Mama’s temperature 3 times a day will help you predict when the puppies will arrive. Birth Documentation Chart – When each of Raven’s puppies were born we documented them individually. Shave mark, color collar, distinguishing features, time of birth, etc. Puppy Weight Chart – We track our puppies weights daily to make sure their gaining each day. Having a handy chart next to your puppy scale or whelping box makes it easy to do this on a daily basis. Vet and Emergency Vet Phone #’s – Keep important phone numbers handy including your vet, emergency vet, and friends or family to help. It’s a good idea to have them written down (as well as programmed in your phone) just in case someone else helping can make the call. Most of these documents come in the Basic Whelping Kit for Puppies. Last year I chatted with a few breeders, my veterinarian, and a couple other folks who’ve whelped puppies. It’s okay for mama to eat the placenta, but don’t let her have more than 2-3. She could end up with an upset stomach and diarrhea. For the record Raven ate 3 last time without issue. Don’t let mama chew through the umbilical cord. She can sometimes chew it down too far which can cause issues. Instead crimp the umbilical with the hemostat and make the cut with your scissors then tie off the cords with your unwaxed dental floss. Use your aspiration bulb to clean out the airways – mouth, nose, and throat. Use disposable cloth to quickly dry each puppy, make sure he’s breathing then let mama do the rest of the cleaning. If mama is pushing for more than a half hour without anything happening then contact your veterinarian. I was completely and totally stressed before Raven’s first litter. After she delivered 6 beautiful puppies I realized she really didn’t need me there at all. Dogs are perfectly capable of handling the entire whelping process on their own. Number 1: As I mentioned dogs are totally capable of whelping on their own. This was proven when I woke up early morning and Raven already whelped puppies on her own. We rushed her and her newborns to the whelping box where the rest of her puppies were delivered. Number 2: Be prepared with all of your whelping supplies well in advance. I was lucky and had most of my supplies from Raven’s first litter and got all the extras before the puppies arrived. Puppies can come early! Make sure you have all you need weeks before the due date. Of course things can go wrong and that’s when it’s good to have your veterinarian’s (or if it’s after hours your emergency vet) phone number handy. I have both numbers programmed into my phone and written down on my “Emergency Phone Numbers” document. If there’s one thing I learned it’s stress and anxiety is not good for me, my dogs, nor the puppies. So, to ease the anxiety, be prepared by making sure you have everything you need on your whelping checklist. Then, let nature take her course. There’s a lot on our whelping checklist. If this is your first litter then I highly recommend you first check out the Basic Whelping Kit for Puppies. What about you guys? Am I missing anything? If so, tell me what you have in your whelping kit in the comment section below. UPDATE: I was recently asked when we start to wean our puppies and what do we feed them. We have a whole series on raising our Golden Retriever puppies from 0-8 weeks old. Whelping Supply Checklist – Everything we could think of that we need for Raven’s next litter of Golden pups. This has been the absolute hands down most helpful guide/list of things we need to get ready!!! We are first time breeders of Cane Corsos and she’s on day 42!!! We are wanting to build our own whelping box as I’ve read so many reviews and blogs and articles on things people would change or do different with their current whelping box. Did you use a online tutorial? Or did you design it and then make a material list and build from that? I went through your list and ordered everything; with I hope enough time before she goes into labor. It’s getting close. I would also be interested in a list of items needed for the post birth 3-8 weeks that are needed. My breeder gave me a list of things I should be considering but I would be interested in what you suggest. 1. We used wing nuts to make it easier to take apart. 2. We painted it with a glossy paint to make it easier to clean. 3. We added adjustable door heights so Raven could easily get out, but the pups could not. 1. The wood warped making it slightly difficult to put back together after we stored it. 2. Although we tried our design was not very easy to take apart for storage nor easy to put back together. I feel like I could do better if we made a second whelping box. 3. Height of the box: I think I would have made ours a little taller. At around 7 weeks our pups start climbing out of the box. I’ll see what I can do about putting together a list you would need for your litter from 3-8 weeks old. It will actually be a good exercise for me because I want to add to my puppy enrichment environment. Good luck with your upcoming puppies! You are amazing. No worries as I am sure you’re busy!!! I’ve bought (or rounded up) everything I can possibly think of for this…I’m usually the one that’s overly prepared or packs to much on vacations or outings. Ha :)) but I can’t ever be to prepared in my mind; two kids, a husband and two CC’s and they all keep me on my toes. We did break down and buy a whelping box through DuraWhlep earlier today. They were by far the most reasonable priced compared to some other name brands for 700-1000$. I got the extra large, a few additional accessories for it and another whelping kit (see, that’s what I mean when I say I’m overly prepared; I don’t neeeeeeed two, but I do 😉 extra whelping mats for a little over 500$ and shipping was 70$ of that; so all in all 430$ in supplies. But it’s still considerably less than other brands so I feel achieved in my research. I’m just worried we ran out of time to find prints/plans and build our own! I’m learning to be a better planner. When Raven had her first litter about 2.5 years ago my only worries were my dogs/puppies. Now I have 5 month old twins and an almost 2 year old so life is a little more hectic. You’ll have to let me know how the Dura-Whelp Box works for you. I saw that one and my only concern was durability. We were planning to use our whelping box for 4 litters over a 4 year period. I do see the Dura-Whelp Box has a 3 year warranty. One other thing I didn’t mention is my pups chewed the rails and the edges of the entry. Our whelping box is still usable, but I think it might only make it through our 4 litters before we need to replace it. One other thing I was just thinking about was when they were older our puppies jumped up against the walls while playing, during mealtimes, and for attention (we did our best not to encourage this behavior). Since the Dura-Wehlp Box is lightweight I wonder if there will be any issues with larger puppies moving, knocking around, or lifting the box off the ground. Regarding building your own whelping box. Ours wasn’t totally complete before our first litter. We had 3 walls, but we were still working on the door way wall. Luckily newborn puppies can only army crawl so we were easily able to contain the little guys for the first day by propping an extra piece of loose plywood as the 4th wall. I’d love to hear updates on how you like your Dura-Whelp Box and how everything goes with your litter of puppies. I forgot to mention I plan to move my babies around 3 weeks (ab the time we start mush) from the whelping box (it will be removed, cleaned and stored away) and replaced with a playyard type of setting; we will use a extra large heavy duty gated, fenced in area for them for the remainder of their time with me. By 8 weeks they are already weighing in around 15lbs and they have very large litters; mine are both 1 in 12 so I am not sure any size of whelping box would be sufficient amount of space unless I added on the weaning room for additional space. And I’m fortunate in having the convinence my whelping area is our downstairs garage where we have it element controlled and concrete flooring so all messes can be easily washed away in the floor draining. We built and designed it (the house) bc I also work from home and run a lisc daycare so that space (the garage) comes in handy during winter months and we need some ‘outdoor’ type activities 🙏🏻🙌🏻 Anyways I plan on setting up an area for whelping and a bed down there for me to stay with them… and then eventually the gated playyard for them as they get bigger. Our Golden Retriever litters were 6 and 8 and 8 was exponentially more difficult then 6 so I can’t imagine what 12 would be like. We’ve also raised litters when we did rescue, but none bigger than 7. Our first Golden litter got pretty big with puppies ranging from 12.5 to 15.5 lbs when they were 8 weeks old. Okay, another question I was going to ask you is how difficult is it to clean poop off the Dura-Whelp Box walls, but since they’ll be out of the box at 3 weeks that shouldn’t be a problem. I think you have a great plan and it sounds like you have a nice space to raise the litter. Keep in touch. I’d love to hear how everything goes with you and your litter of pups! OK, after reading this. I’m nervous for you! It sounds like you have everything completely under control, but what a lot to have to think about. I’m looking forward to seeing the puppy pictures. I was super nervous before the first litter. Yes, I had raised 2 rescue litters before Raven’s first, but I wasn’t involved at all during the whelping. Now that we’re on our third litter I’m still nervous (you never know what could go wrong). At least now I have some experience under my belt. Lots of pics coming soon! You may want to check out my social channels too as we will be posting pics and videos on Facebook, Instagram, and YouTube.